Doğaner Signage Systems, a Nova Polymers Preferred Fabricator from Turkey attended their first European Sign Expo to showcase their accessible signage production capabilities, using Nova Polymers’ materials and equipment. 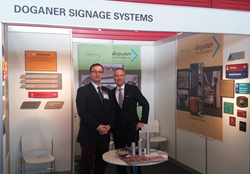 Dave Miller and Yakup Çolak at FESPA 2016 in Amsterdam, Netherlands on Doganer Signage System’s booth. As accessibility in the built environment and specifically commercial spaces becomes more of a focus for developing economies, we are pleased to partner with companies like Doğaner who share our passion for education around accessibility laws, and codes. Accessible Signage is taking over Europe as Doğaner Signage Systems, a Nova Polymers Preferred Fabricator from Turkey attended their first European Sign Expo in Amsterdam, Netherlands. Sign Expo 2016 is Europe’s leading exhibition for the signage and visual communications industry, with over 100 leading brands and suppliers represented at the show, and is hosted by the Federation of European Screen Printers Assocation (FESPA). Doğaner Signage Systems showed their capabilities of producing accessible signage to the European market, using Nova Polymers materials and equipment. “In an emerging market like Turkey which is starting to embrace ADA accessible signage, we are proud to be the first company to introduce Novacryl. With the support of Nova Polymers, we can now offer quality photopolymer products throughout Europe.” said Yakup Çolak, General Manager of Doğaner Signage Systems. Dave Miller, Director Global Business Operations for Nova Polymers, who was present at the show added: “As accessibility in the built environment and specifically commercial spaces becomes more of a focus for developing economies, we are pleased to partner with companies like Doğaner Signage Systems who share our passion for education around accessibility laws, and codes - specifically the ADA and DDA”. Nova Polymers’ Preferred Fabricators have to participate in a process audit to ensure that they adhere to the guidelines and processes specified by Nova Polymers for the production of photopolymer accessible signage. Nova Polymers is the largest manufacturer and distributor of photopolymer sign products in the United States, Canada, Europe, The Middle East and Australia. The company developed the world’s first CLEAR photopolymer sign material. The introduction of NovAcryl continues to have a profound effect on the creative potential of the sign design and fabrication industries. Today, Nova Polymers continues to work with the Architectural Signage and Design community to expand their high quality and progressive product line in ways that will add creativity and flexibility while maintaining & exceeding ADA compliance guidelines. Nova’s goal is to educate the design community so that there is demand created for the products fabricators manufacture. Further information is available on the web at http://www.novapolymers.com. Doğaner Signage Systems launched in 1991 by producing interior and exterior signage, and then extended its range of products with Curved System, Flat System (Plasma), Lens Covered Interior and Exterior Routing Panels, Exit Signs, Fire Exit Signs, Illuminated/Unilluminated Information Booths, Wall and Corner Guards, Interior&Exterior Illuminated/Unilluminated Totems. Now a Nova Polymers Preferred Fabricator, they produce ADA compliant signage photopolymer plates and ADA and TS1911 compliant interior/exterior signage.